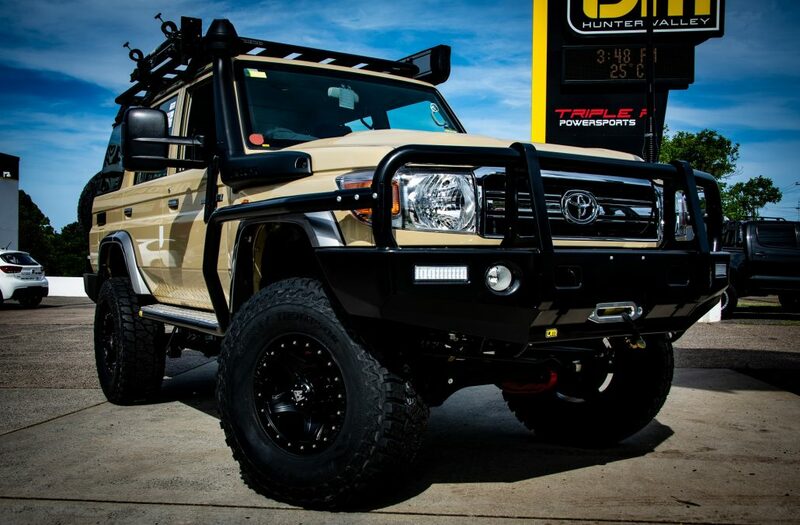 Nothing says classic Toyota more than a Sandy Taupe 70 Series Landcruiser! It was definitely a bucket list item to own a new one for our customer Tim, who after hearing about what we can do to these things, gave us a call for a quote to get the full kit. The quote soon became a reality and the orders were given for the guys at Penrith Toyota to ship the brand new 76 wagon up to us to get the once over and waive our magic. There were special orders along with this build though, as Tim had specifically requested that he didn’t want to see the car until it was completed. Not only that – he hadn’t even told his mates about it, with the intention off just rocking up one day in this new – fully built weapon of a wagon. A Jmacx rear coil spring conversion was a must for this build and this particular kit was finished with Kings remote res shocks, custom Jmacx 4″ coil springs, billet Jmacx front radius arms and of course that bulletproof Jmacx fully refabricated rear axle assembly – bringing the GVM up to 3900kg and fully legal lift of 4 inches. 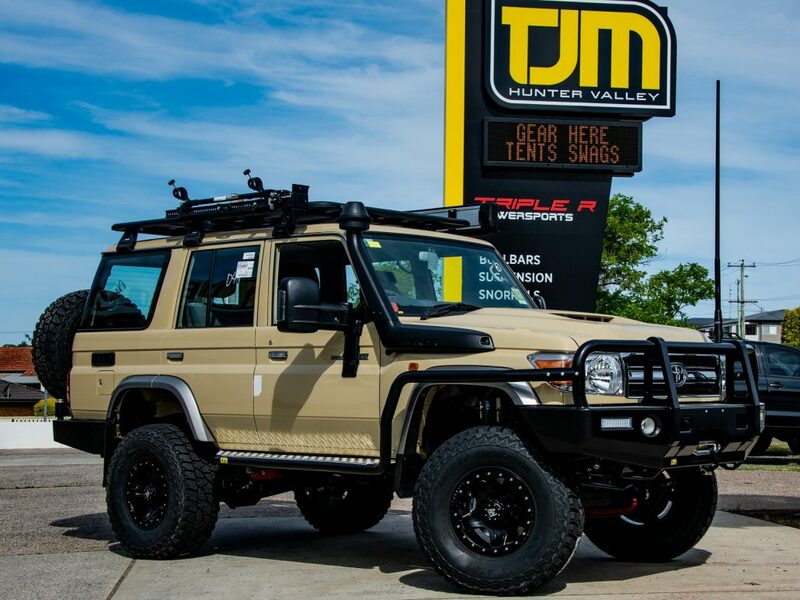 Bar work is the full TJM compliment including the T13 Outback bull bar, brush bars and side steps, as well as a TJM front underbody guard making the front end as bulletproof as the rear. 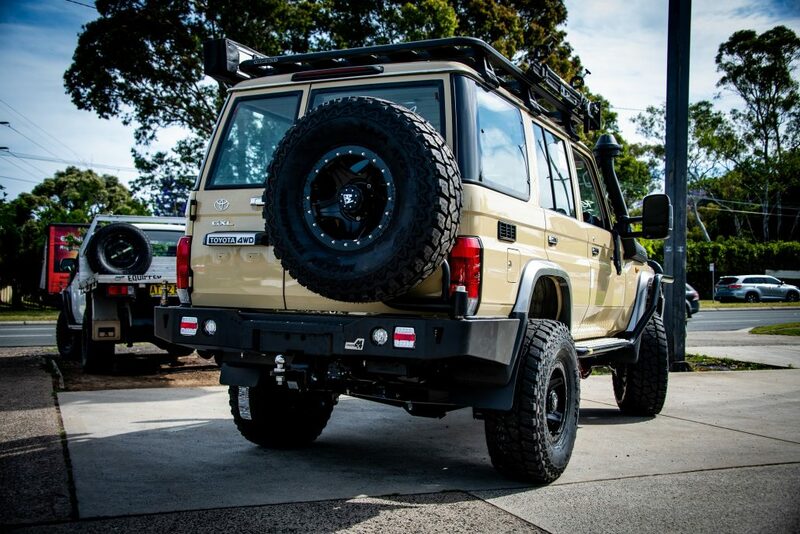 Rear protection is thanks to Uneek 4×4 rear bar with single wheel carrier setting this 76 apart form the rest. 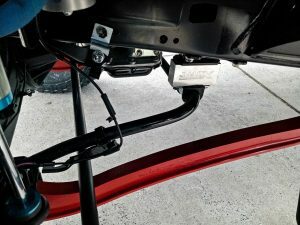 The bull bar houses a TJM Torq 12,000lbs winch featuring synthetic rope and wireless remote function. 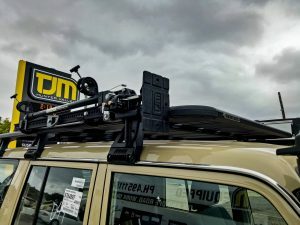 Load storage is increased with a Pioneer Platform by Rhino Rack which also carries the TJM high lift jack and Darche 270 Eclipse awning giving the best protection possible from the elements. 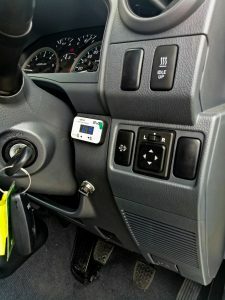 An iDrive pedal controller was fitted for improved engine responsiveness and reduced turbo lag. 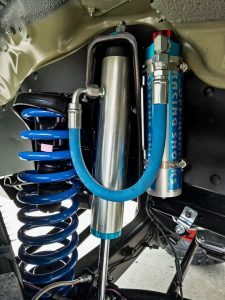 This works well in combination with the Torqit 3.5″ stainless steel exhaust designed specifically to suit the routing requirements of the Jmacx coil cradle. 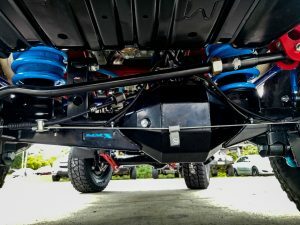 The engine has been given the best chance to survive harmful exhaust gas and oil recirculation with a Taipan billet alloy, chassis mounted catch can. 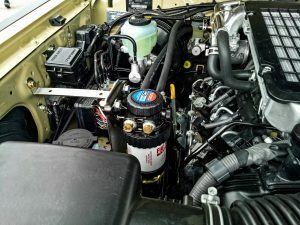 Extra protection against fuel contaminates in today’s age of fragile common rail fuel injection systems is taken care of by a Diesel Care secondary fuel filtration system for added insurance. A Harrop 4 port breather unit was also fitted to supply vital ventilation to both diffs, gearbox and transfer case. A luxury often overlooked by 70 Series owners is not having to climb over the passenger seat, drop the window and adjust the passenger side mirror. Fortunately Clearview Towing Mirrors are all over this and have designed a mirror that not only offers superior vision when towing but also the convenience of power adjustment from inside the cab – something all 70 Series owners would have cursed about lacking at one stage of their lives or another. A set was bolted up to this Sandy Taupe beast finally bringing it in to the modern era of motor cars. 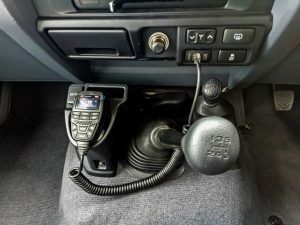 A GME XRS UHF radio was fitted to take care of comms and a Redarc Tow Pro Elite handles trailer braking for those towing trips. A set of Black Duck canvas seat covers were fitted front and rear to handle the dirty conditions that comes part and parcel with the off-road lifestyle. The whole build is rolling on a set of 16 x 8 Allied Savvana Imitation Bead Lock rims with a -15 offset and Mickey Thompson ATZ P3 tyres measuring 315/75 x 16 to get traction to the ground. These are not only a tuff wheel but really set the look of this wagon off. Tim is over the moon about his build and the element of surprise really put the icing on the cake. Tim’s mates were blown away when he lobbed in his new beast and I’m sure we will see more of this thing to come yet.